© 2018 INADR | 108 N Walkup Ave., Crystal Lake, IL 60014 | All Rights Reserved. 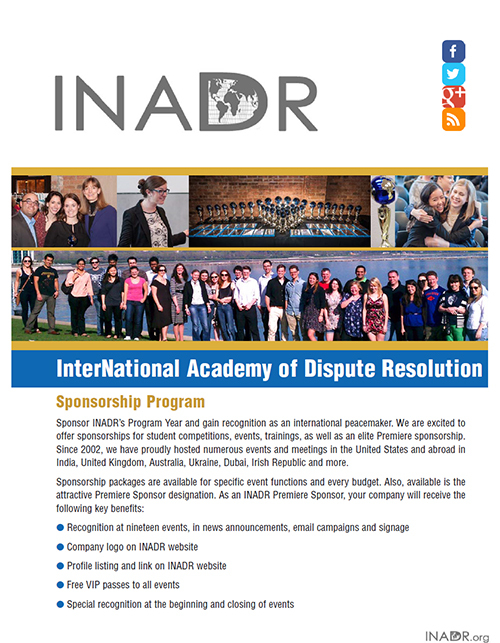 Sponsor INADR’s Program Year and gain recognition as an international peacemaker. We are excited to offer sponsorships for student competitions, events, trainings, as well as in elite Premiere sponsorship. 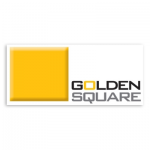 Since 2000, we have proudly hosted numerous events and meetings in the United States and abroad in India, United Kingdom, Dubai, Kiev and more. 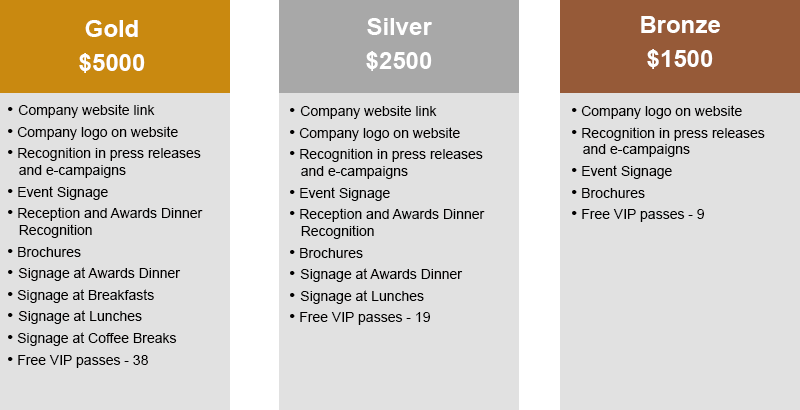 Recognition at nineteen events, in news announcements, email campaigns and signage. Company logo on INADR website. Profile listing and link on INADR website. Free VIP passes to all events. Special recognition at the beginning and closing of events. If you or your company are interested in sponsoring one of the many activities of INADR please contact Meghann Sweeney at iadrexec@gmail.com or call her at 515-778-6048. Brenau University (www.brenau.edu) in Gainesville, Georgia will be hosting its seventeenth annual Mock Mediation Invitational Tournament on October 4 and 5, 2019. 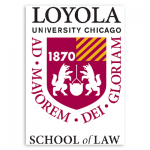 This three round tournament will also include opportunities for training for students and coaches on mediation techniques and advocacy in mediation. Registration fees are $75.00 per each three person team and $25.00 for each extra individual including coaches. Fees include the awards luncheon on Saturday, October 5, 2019. Registration begins at noon on Friday with training to begin at 1:00 pm. Tournament rounds will be held on Friday afternoon, Friday evening and Saturday morning. Space is limited, so register as early as possible. The registration deadline is September 30, 2019. For registration forms or further information, contact kfrank@brenau.edu. Make hotel reservations early and for a list of local hotels which have special rates for Brenau related events, please send an email. We hope to see you in October in Gainesville! The 2019 INADR International Intercollegiate Mediation Tournament will be taking place at Osgoode Hall Law School in Toronto, Canada, November 1-3, 2019. More information to come!